The ALBA Group Asia subsidiary of Berlin-based ALBA Group, Baguio Waste Management & Recycling Limited and Swire Beverages Holdings Limited have formed a joint venture (JV) to operate a recycling and reprocessing facility for plastic scrap in Hong Kong. Recycling polyethylene terephthalate (PET) and high-density polyethylene (HDPE) bottles into secondary resins will be the primary focus of the new plant. The facility is expected to be built within Hong Kong’s EcoPark and to be operational by the third quarter of 2020. Baguio was approved as a tenant at the EcoPark in late 2017. The JV has been designed to combine the strengths of Baguio’s domestic collection network in Hong Kong with ALBA’s recycling technology experience and Swire Beverages’ marketing and advertising reach in the Hong Kong beverage market. The facility will process post-consumer PET beverage bottles and HDPE personal care bottles, which the companies have deemed as collectable in the foreseeable future. The plant will include a near infra-red (NIR) sorting facility and two secondary resin production lines–one for food grade PET flake and the other for HDPE pellets. Germany-based ALBA has been involved in Hong Kong as the builder and operator of an electronics recycling plant in the city. 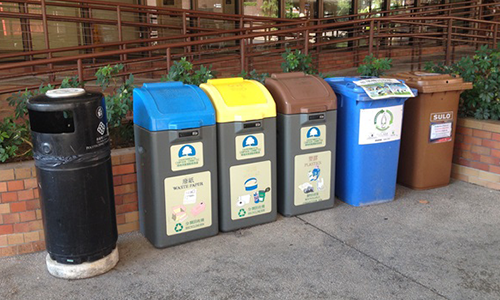 Hong Kong-based Baguio has been collecting post-consumer recyclables in Hong Kong for several years, as detailed in this 2015 Recycling Today feature article. Swire Properties Limited has been appointed as the project manager for the design and construction of the facility.